So begins the beautiful and touching story of an Osprey, a boy named Callum and a girl with an adventuresome spirit named Iona McNair. Wild Wings by Gill Lewis tells the griping story of Callum who lives in Scotland and a girl from West Africa who together save a migrating Osprey and saving each other as well. This is a modern day story which flows easily and grabs the readers attention immediately. It is a captivating story which has us in the countries of Scotland and Gambia. Wild Wings is a perfect combination of fiction based narrative and actual nonfiction facts about Ospreys and their living environments and migration patterns. A perfect read for a child who loves nonfiction as well as enticing a reluctant reader. Wild Wings is also good for the deep thinker and has children reflecting on many deeper issues as hand such as decisions about friendships, not giving up, moving on after losses, and awareness of how we take things for granted in our relatively privileged society. It is an engaging story of how every one of us makes a difference and working together as a community both near and far can solve what seemed an insurmountable problem. Grab your copy of this wonderful and compelling kidlit book here. What would you think if I invited you on an Osprey’s incredible journey, just like the one Callum and his friends took? Flying high above mountain ranges, oceans, and expansive and huge deserts, the osprey travels thousands of miles to migrate to warmer weather. 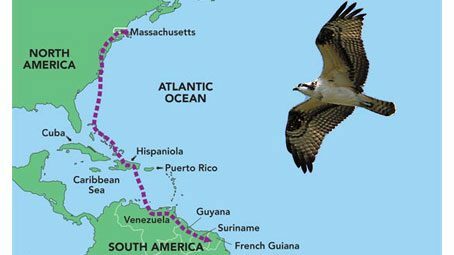 Using satellite tagging, scientists are able to learn more about the osprey’s migration routes and about where they breed and where they winter. Author Gill Lewis in 2011 followed such a journey and has shared it with all of us. Start here for an amazing high flying adventure. The osprey also known as the fish eagle, sea hawk, river hawk, or fish hawk, is a fish eating bird of prey. It is a large raptor, reaching more than 24 inches in length and 71 inches across the wings. It is brown on the upperparts and predominantly greyish on the head and underparts. The osprey tolerates a wide variety of habitats, nesting in any location near a body of water providing an adequate food supply. It is found on all continents except Antarctica, although in South America it occurs only as a non-breeding visitor. It’s known as a fish eagle and the osprey’s diet consists almost exclusively of fish. The osprey weighs between 2 and 4 pounds. After the peregrine falcon, the osprey is the second most widely spread raptor in the world. It can be found in mild and tropical climate. In North America it breeds from Alaska and Newfoundland and to the south in the Gulf Coast region as well as Florida. The osprey then winters in South America. In summer it is found throughout northern Europe, in Ireland, Scandinavia, Scotland, England, and Wales but not in Iceland. When in Europe the osprey winters in Africa. In Australia the osprey doesn’t migrate at all but remains on the coast and then flying to Western Australia to breed. To learn more about the Osprey here is a very in-depth interactive Curriculum from Friends of Blackwater Reservoir in Maryland called Project Osprey Curriculum . This guide is very through and covers everything you need for Common Core. Matched with the book Wild Wings, it’s a perfect combination. Wild Wings sounds like a wonderful book! It would pair perfectly with my book “The Call of the Osprey,” a Scientists in the Field book from Houghton Mifflin Harcourt chosen as a best book of the year 2015 by the National Science Teachers Association. My book covers basic osprey facts and focuses on research at the University of Montana on heavy metals in the blood of osprey chicks from past mining along the Clark Fork River ( http://hs.umt.edu/geosciences/osprey/ and Facebook page http://tinyurl.com/ndc9gu2 ). It also follows the lives of two osprey pairs in Montana with video cams on their nests. The cams are sponsored by the Cornell Lab of Ornithology ( See http://cams.allaboutbirds.org/all-cams/ under “Dunrovin Ospreys” and “Hellgate Ospreys.”).